Going into Friday night I knew we had to hit Firelands fast and hard. We had a full raid that night – Grom was out all weekend but I’d already arranged for his spot to be covered. My tank and healer setup was all in order. And with luck we wouldn’t have lag. We were a bit slow getting started but after just under an hour of raid time, maybe 40 minutes of actual trash clearing, we were ready to start Shannox attempts. Our first few attempts had the first dog almost dying before something happened to wipe the raid – usually Log, our Shannox tank, dropping, or someone getting stuck in a prism. I kept an eye on the healing as we went. Kerick and I were pulling some insane numbers, some fights we were close to 14k HPS each and staying ok on mana. Jhudora, our shaman healer, was struggling to get her numbers up. I know HPS numbers aren’t very meaningful but you can tell that when the third healer’s numbers are well below the others, something’s up. I kept an eye on it and made a mental note to do some research on shaman heals later. After an hour of attempts we were starting to look good, consistently getting the first dog down and then working on the second dog and Shannox simultaneously. We had a discussion during the raid – someone said she’d always seen the fight done by burning Shannox to almost 35% and then burning down the dog rather than splitting dps like we were doing. But it doesn’t matter whether you burn one then the other or split damage and it works better for melee if they can stay on Shannox the whole time rather than running after the dog. We got to the point where I knew any pull could be our kill. It was closing in on two hours of attempts – three hours of raiding total. I had hoped we’d get him down a little faster but this was our first kill after all and we were still learning. We had a good attempt going. Log kited Shannox a long way. We headed back toward the entrance – and I see a pack of scorpions come running at us. No way we can handle this in the middle of what we’re doing. They aggro on Kerick and she dies but then they reset. I’m still not quite sure what happened there, whether Addoe fake died or what, but hey, the scorpions were gone and I had a brez with Kerick’s name on it. She got up, we caught up on heals – and then somehow, the boss was dead on the ground. I must say the kill itself was almost anticlimactic. I was almost surprised that he was dead – that happens sometimes when healing, I don’t really notice the difference between 10% and 1% until boom, the boss is dead. We got one crafting ember and one ember for Falahla’s staff so she is officially on the way to the legendary! Saturday we had a bunch of our regulars out, so Kerick’s friend Sorak brought a rogue over to play and we invited all our sometimes-regulars and Bocat as well. The plan was to just clear a bunch of T11. We made pretty decent time in BWD, took about two hours. One Chimaeron wipe due to a “talk to the robot not the gnome in the cage” pull accident and I think three tries to kill Nefarion. Then off to BOT. We managed a trash wipe from face pulling, oops. And we swapped a few people in and out depending on fights. There were a couple people who wanted a Cho’gall kill on an alt rather than their main, like Reversion wanted to get it on his hunter so one of the melee agreed to bring in his tank for that fight. Jhudora wanted to kill Cho’gall on her priest but was saved to the first three on her priest. So that added a little time to our adventures. It was getting late when we got to Cho’gall and I didn’t think we’d have time to do Al’Akir. But that was ok, we were having a great time. 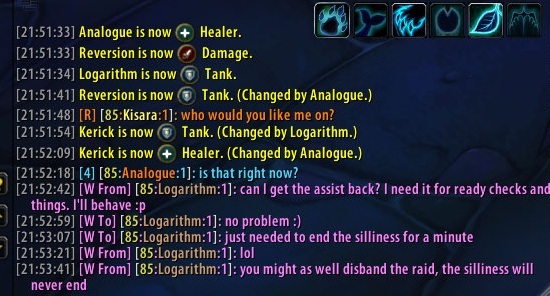 With all the people swapping in and out the roles got kind of confused so one of the healers asked for a role check. Naturally this was time for some of us to misbehave. I selected “Tank”, Reversion selected “Healer” and Log picked “DPS” all at once. then we had some silliness as I manually fixed the wrong roles. When Log is right, he’s right. It doesn’t happen that often (kidding!) so let’s give him his dues. Let’s see … let me start at the top. If Jhudora wants to try swapping roles around, that’s fine with me. Only thing is, Rev moves around a LOT and it seems like having beacon on him and someone else following him is most effective. But I’m fine with trying something different. Oh yeah, scorpions. So I *did* die to stupid. I didn’t even see them over there. They reset when I died because I was the only one who had aggro on them. I am thinking she gets Rev, you keep Log, and I do raid. Your side of the healing was really solid and no need to mess that up. Now I want to see YOUR screen. Heh. Might have to check that scorpion pack next time and kill it, chances are we’re going to have to kite a good ways again until we get a bit more dps. I hadn’t realized the fight took almost 10 minutes til I saw your kill shot. Yeah… hmm. See, sometimes you should actually mention to me what the healing plan is because I could have told you to use that setup after the second or third pull. That’s not how it was set up to begin with? I thought it was. Hope you passed, but don’t worry, you’ll get the next kill and hopefully some first kills on other bosses this week.